It’s 5:49 pm on a Tuesday evening. You finish a blog post, hit publish and head to dinner. When you arrive at the office on Wednesday, you eagerly check your metrics only to find that your post barely attracted a handful of visitors. And one of them was your mom. A frustrating situation for sure, but not unusual. In the crowded and competitive online world, your content doesn’t stand a chance unless you promote it. Plenty. In fact, your job has barely started. Many experts cite the 80/20 rule, suggesting that 20% of the time you spend on content should be dedicated to the creation process and 80% to promotion. Yet, promotional strategy effectiveness tends to change. BuzzSumo just released a new Content Trends report which suggests that the content promotion strategies we used just three years ago are 50% less effective today. But, quite frankly, I’m relieved to see this data. Three years ago, many companies still favored quantity over quality, and some companies are still stuck in that mindset. This report from BuzzSumo may be exactly what you need to convince your stakeholders that it’s time to slow down and focus on building quality content and real relationships with people who will engage with it. To that end, here are 5 content promotion techniques that can improve your game and the content marketing tools that make it easier. Promoting new content to your social channels is common practice, even with the decline of organic reach. But unless you create and adhere to a promotional schedule, it’s easy to share your content once or twice then forget about it as you move on to your next project. Avoid this trap by developing a basic social media campaign that you can use for every piece of content you create, then save it as a template. Plan the precise wording of every social message in advance, if you can - build a vibrant collection of social posts with varying text, images and hashtags that all promote the same piece of content. It’s fine (and even advisable) to share the same content on your social channels multiple times, but you should look to alter the text, and weave it in with other types of posts, so that your social presence doesn’t become stale. Finally, plot your messages on a calendar. This is where the tools come in. If you publish fresh content once or twice a week (or less), planning your content and social sharing schedule with a task management tool (like Asana or Trello) might work just fine. But if you publish content more frequently, a robust tool (like CoSchedule or Sprout Social) will make your life a lot easier. After you publish the content (and the campaign is underway) track your results and make any necessary adjustments as you go. Of course, if you’re going to invest time into planning a social media campaign you'll need an audience. And not just any audience, you want an active and engaged audience. You need contacts on social media who actually care about what you have to say, and wll interact with your posts and help expand your reach. Where can you find such connections? If someone expressed interest in your content once, they’re likely to do so again. Nurture these connections by following them, engaging with their posts and looking for opportunities to converse. I find that Twitter is one of the best platforms for this activity - due to the open nature of the platform, people are more receptive to connecting with the broader community. When you receive a retweet, like or mention (in response to a piece of your content) take a look at that person’s profile. If they’re of interest, follow them, and add them to a list so they stay on your radar. As your relationship matures, look to connect with them on other platforms as well. It’s unlikely that you’re the only person creating content about your topic. Find other companies or authors who are writing about similar or complementary topics, then connect with them and/or the people who interacted with their content. I understand that some authors will be more desirable connections than others. If you don’t approve of their content, or if they're a direct competitor, you may prefer to keep your distance. But if they’re an influencer in your space or if they target a different market, you may choose to pursue a relationship. Again, on Twitter this is easy. 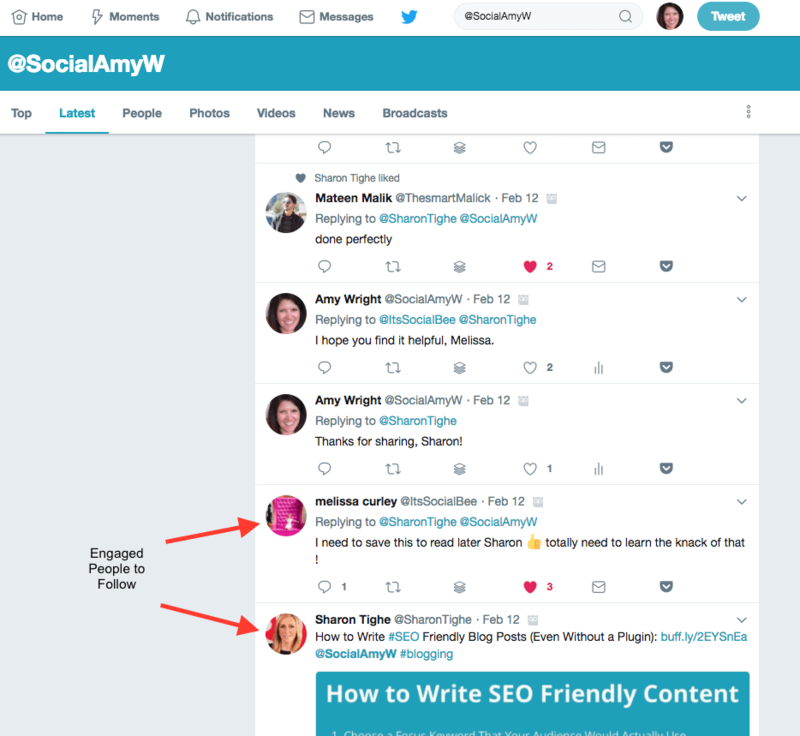 Once you find someone of interest, follow them, then enter their handle into the search bar, choose “latest” and scroll through the results to find people who engaged with their content. 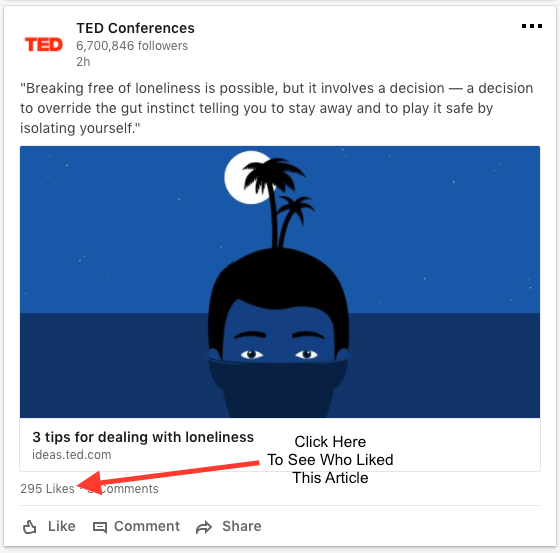 If you favor a different social media platform, most of them offer something similar - on LinkedIn, for example, you can see who engaged with a piece of content by clicking the "likes" link that is located below the image. Building relationships with people who interact, either with your content or content that's similar to yours, is one of the best ways to build an engaged audience. And, as usual, there are tools that make it easier. In BuzzSumo, for instance, you can research a topic to get a list of relevant articles. 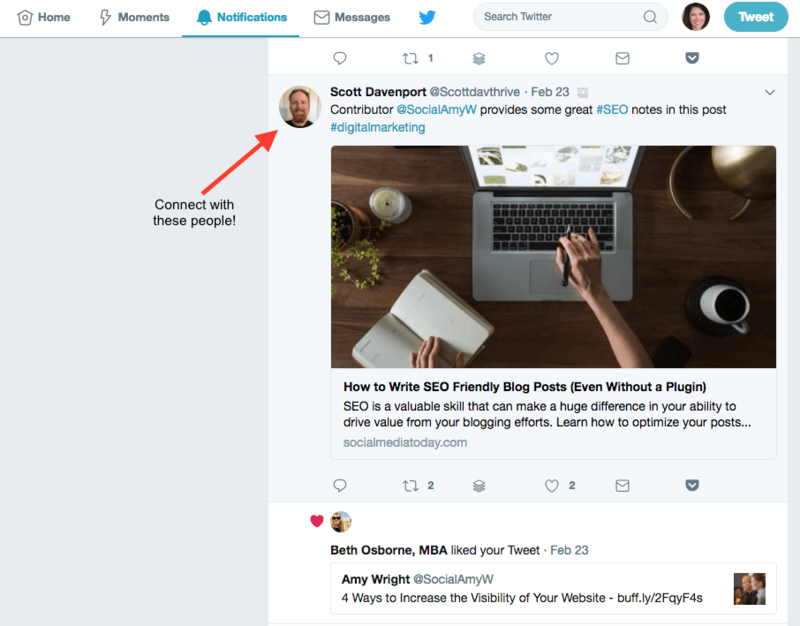 Next to the article name is a link for “view sharers” - if you click that link, you'll see everyone who shared the article on Twitter, and you can follow anyone of interest right from within BuzzSumo. With the proliferation of online content, the market for that content has become saturated. One of my fellow marketers, Mark Schaefer, dubbed this concept “Content Shock”. This doesn’t mean that content marketing is “dead”, but it does mean that higher quality content (content that is well-written and addresses the topic in-depth) will win out over shallow, poorly written content that was produced in a hurry. This wasn’t always the case. There was a time when companies could achieve a high rank in Google simply for producing tremendous volumes of terrible content. That time is long past. So, now we know that we must produce only high-quality content. Great. But this introduces a new problem. Quality content takes a long time to plan, research and create. In other words, it’s an investment, and if you’re going to invest, you may as well get the most value for your money. How? I could continue but I think you get the idea. Don’t just create one piece of content, repurpose your message into various formats to boost the appeal of your message to a broader audience and expand your reach. And, don’t limit yourself to your own website. Repost content to suitable venues like LinkedIn, Medium and certain industry publications (just be sure to use the rel=canonical tag (when needed) to avoid duplicate content issues). Finally, after some time has passed and the traffic has dissipated, refresh the piece with updated quotes, statistics, links and information, then look to publish it again. One of the more natural (and cost-effective) ways to promote your content is to look for cross-promotional opportunities. The possibilities here are endless - you can cross-promote content on your own website and across communication channels, or you can look for ways to work with other companies or industry influencers. Update your email signature with a link to your newest materials. Share new resources and blog posts with your customers in a monthly newsletter. Link to key pieces of content in email campaigns. Install a plugin or tool to automatically promote related content on your blog or elsewhere on your site. Link to one piece of content from another. Pin a post promoting your latest content to the top of your Twitter profile. Update sales and customer support materials with relevant links to fresh content. Highlight new resources on your homepage. Link to content in presentations, webinars and podcasts. If a conversation or question inspired a blog post, email it directly to your muse. To expand your reach to a whole new audience, however, nothing beats cross-promotional opportunities with others in your space. If you’ve been growing your audience (as you did in section two) you probably have relationships already that would lend themselves to this. It’s just a matter of deciding where to invest your time. Partner up with companies that aren’t in your space at all, but who share a similar audience – wine and chocolate anyone? This isn’t a case of saving the best for last. Many organizations engage in content marketing due to the promise of organic reach, and you will get there in time. But, if you want to speed things along, it doesn’t hurt to experiment with paid promotion. Advertising on social media is still relatively inexpensive and highly targeted. Remember the organic social media campaign from step one? Give it a few days (or longer) to see which messages are the most successful, then give those rock star posts a little boost. Or, if you’re willing to plan in advance, install a piece of code on your website and retarget your visitors with a campaign on your social platform of choice. Have you ever noticed the “related” content on your favorite news sites and wondered how it got there? This is the work of a content syndication network. Services like Outbrain or Taboola can help you promote your content on premium content destinations and provide you exposure to a broad audience. Content promotion is an essential part of any content marketing strategy, and there are hundreds of techniques to choose from. The above suggestions are a great place to start - choose those that you feel will be most suitable for your target audience, and don’t forget there’s probably a tool to help.